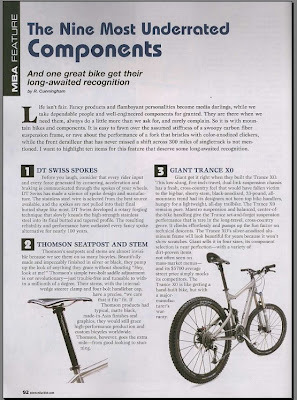 The April 2009 issue of Mountain Bike Action magazine contains an article titled "The Nine Most Underrated Components," where they praise such humble yet critical parts like DT Swiss brand spokes. The only bike worthy of mention in the article was the '09 Giant Trance X0. "Giant got it right when they built the Trance X0. This low-slung, five-inch travel, dual-suspension chassic has a fresh cross-country feel that would have fallen victim to the big-bar, shorty-stem, black anodized, 33-pound all-mountain trend had its designers not been top bike handlers hungry for a lightweight, all-day trail bike. The Trance X0 remains pure. Maestro suspension and balanced, center-of-the-bike handling give the Trance set-and-forget suspension that is rare in the long-travel, cross-country genre. It climbs effortlessly and bumps up the fun factor on technical descents. The Trance X0's silver-anodized aluminum frame will look beautiful for years because it won't show scratches. Giant sells it in four sizes, its component selection is near perfection - with a variety of dirt-proven items not often seen on mass-market menus - and its $5700 average street price simply mocks it competitors. The Trance X0 is like getting a hand-built bike, but with a major manufacturer's warranty." You can take a free test-ride on the Trance X0's little brothers, the Trance X3 and Trance X4, as well as others from our fleet of new Demo Bikes. Just call or stop by any of our stores and ask about the bike demo program!